The unique shape of the Kalispell floor plan creates a log home that provides a stunning view of the surrounding area – making this floor plan perfect for any parcel of land. This 2,603 square foot log home is ideal for a retirement or vacation home; adding a basement can expand it’s potential, creating the perfect family home or getaway! Main floor. The spacious master bedroom, complete with walk in closet and large bath, creates a wonderful, private space for relaxation and rest. The large family room, living room, dinning room and kitchen make a delightful space for enjoying company and creating memories. This open concept design creates an open and carefree atmosphere, conducive to reducing stress and promoting relaxation. The beautiful covered entry, framed by magnificent flared Western Red Cedar posts, provides a warm welcome to all who come through your door! 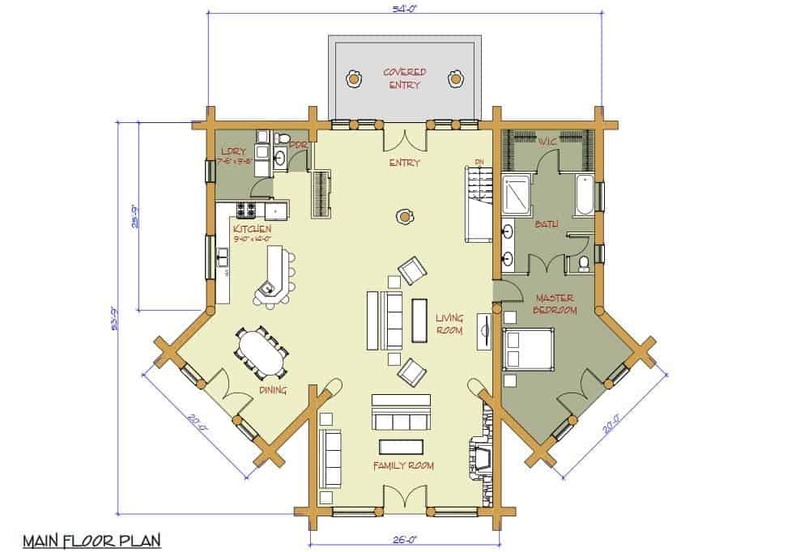 As with any of our log home floor plans, the Kalispell floor plan in completely customisable. Add, remove or repurpose rooms to fit the unique needs of you and your family! Interested in this log home floor plan? Contact us today for more details.